Are you anticipating another disagreeable interaction among your guests? Is there one guest who always seems to stir things up? It’s incredible how one person can ruin a gathering. Sometimes it’s the combination of guests can make for a volatile situation. Regardless, as a host, your goal is to provide a welcoming atmosphere for all. And, that no one finds themselves with their back against a corner being lectured by another guest. Give some thought to your seat assignments; provide ‘place cards’ and don’t seat two outspoken people together. Serve the meal buffet style; this allows people to roam or excuse themselves from a fiery conversation. The vegan lifestyle. Sharing why you became vegan or how it has improved your health, is one thing, but it is never acceptable to lecture anyone about their choices. For the vegan: as a guest, if you know that there will be non-vegan approved food and you are adamantly against it, don’t attend. If you don’t want to miss out on the gathering, offer to bring a dish or two. 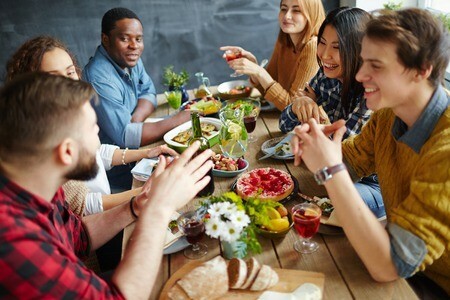 For the host: Because people’s dietary lifestyles vary and change, have a few options available, or ask family members to help make something. The lifestyle change. 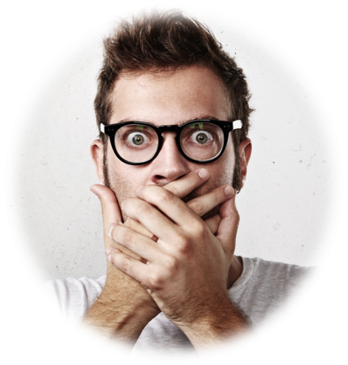 If you are intentionally blurting out news about a fringe-career or major lifestyle change to shock, arouse or provoke people, don’t. Especially if it’s not your party. For the guest: If you’ve got an announcement to make about anything, but especially a non-traditional one or life-changing, speak to the host in advance. It is up to them to determine if the occasion is appropriate. Option: Throw your own party. For the host: If a guest “takes the mic” to share a personal style of living change, quickly approach the outspoken guest and ask to speak with them privately. Advise them to share their news with select people, individually; a more effective way of sharing. If they get upset, let them. The cocky cook. There is always one guest in the crowd who has a superior recipe or learned from some amateur chef on their last vacation how to make “it” better. If you know that your sister in-law or your friend’s boyfriend always taste-tests your dish or stands over your shoulder as you cook, give them their moment. Here’s how: Ask them to bring their finest dish (they can brag all night about it) Or, if they won’t leave your kitchen, ask them to take over one of your dishes (it will give them something to do and let you peacefully work on your other dishes.) In other words, accommodate his/her quirk–why work against it? Whether in the workplace or family gatherings, there will be unexpected interruptions, under cooked potatoes, and incompatible people. Finding a way to work around them or to accommodate their quirks, can diminish stress and drama. Keep a movie going in one room. Ask guest to prepare a memory about another guest, a vacation, an accomplishment/goal, or if it’s around the holidays, a reason to be thankful. Have a food drive or collection for a cause that they can all get involved in. Have a buffer; a person you can count on to roam around the room, interrupting if he/she sees a dilemma brewing. Start your staff meetings with a selection from my book. There are a variety of workplace dilemmas to choose from; a good way to help promote conversation and resolve conflict. 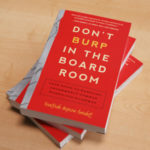 Rosalinda Oropeza Randall, Workplace Civility, Communication Skills, Business Etiquette Expert, Media Source, and author of “Don’t Burp in the Boardroom.